Dr. Raymond Dempsey practices periodontics and implant dentistry at Auburn Family Dental. 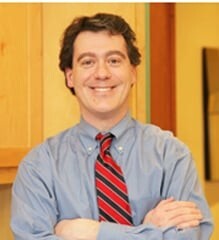 Dr. Dempsey earned his bachelor's degree in biology from Trinity College in Connecticut and received his doctorate in dental medicine from Tufts University. Dr. Dempsey did his residency in general dentistry at Mount Sinai Medical Center in New York City. He then did his training in periodontics and dental implants at Case Western Reserve University in Ohio.